It is spring in the southern hemisphere. 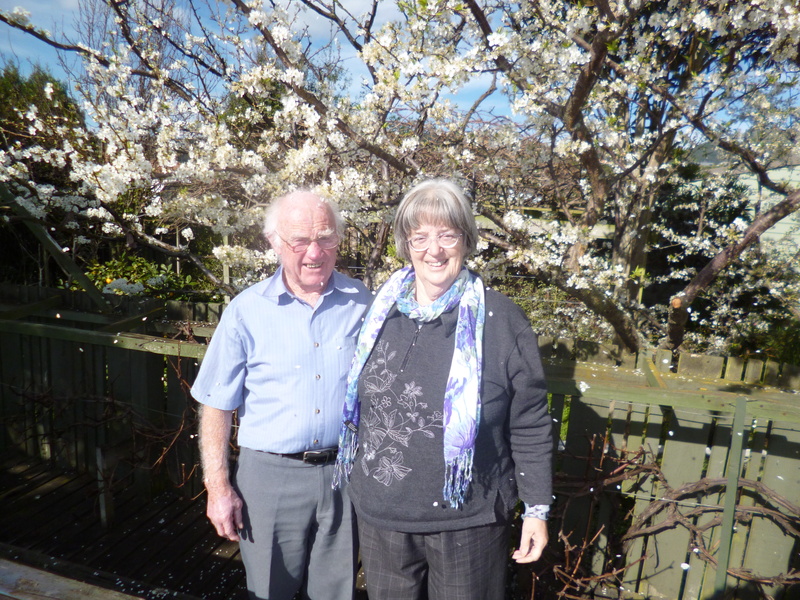 Rosalie Sugrue writes — “The NZ Listener ran an article entitled Dear Dad. Nine famous Kiwi’s commemorated Father’s Day by way of writing a letter to their own deceased father. The results were moving tributes to very diverse fathers. 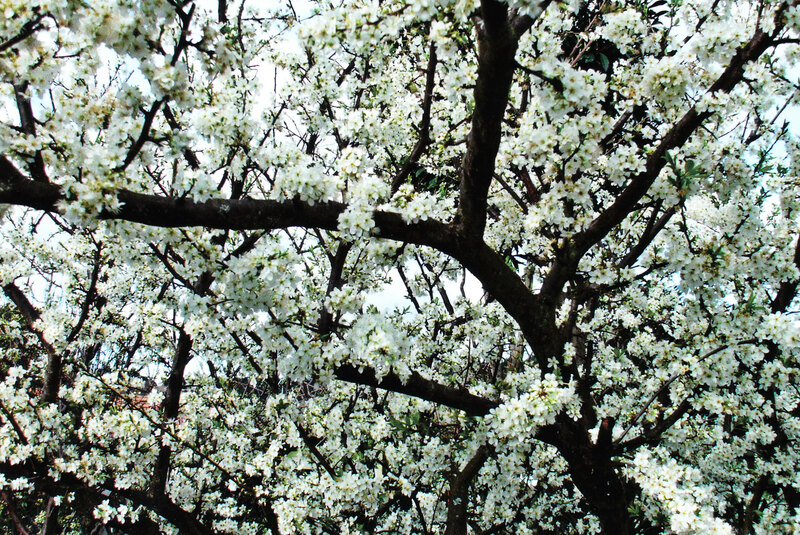 I decided to take a leaf out of their book, so to speak, and pen a letter to Abraham from his son Isaac.” The photograph is of the plum tree in Rosalie’s backyard. I don’t know how you did it, living to such a great age in perfect health. As for me my eyesight is starting to fail but I can still write if I hold the parchment close. I am a father myself of fine twin boys. Like you it didn’t happen immediately. But I did what I could. I prayed and God blessed us. The wife you bid your servant seek for me has proved to be all I could desire. When Rebekah stepped down from her camel it was love at first sight and has continued thus, but being a father is not easy. This I now know and didn’t know when you were around. I will be frank Dad – there were times when I wished you were different. I know you were busy, an important man, head of a large household with many matters to occupy yourself with but for one who so desperately wanted children you gave us little of your time. Ishmael was 13 before you took any notice of him and then it was to cast him out. I felt it very wrong of you to banish your firstborn. He was my half-brother and we played together. I woke one morning to find my big brother had vanished. I was not able to even say goodbye. I missed my playmate and I missed his mother. Hagar was young and fun, a caring person, in retrospect a woman of great insight. I heard from the servants that you had sent them away because you wanted me to be your heir. At the time it made me feel special but later I realised it was not me for myself you wanted as your heir, it was me son of Sarah. Everyone knew Sarah was first wife and head wife. Surely you did not need to send Ishmael and Hagar into desert. If it had to be, you could have supplied men and donkeys to give safe passage. But now my own sons are almost grown and I know from experience fatherhood is hard. Children have their own personalities, being impartial can be difficult. I tried to be a better father than I felt you had been but I confess a weakness in favouring my elder son. Esau is such a delight, an active lad, impetuous and daring. He has become a skilled hunter. I used to take both boys hunting. I saw that as part of the father’s role, but the younger one had no heart for it. Jacob has brains alright but he is a mother’s boy. Dad, I would have liked you to have taken me out hunting. That day when you sharpened your knife and told me I was going on an expedition with you was the best day of my life. My heart soared at the prospect of us spending father-son time together. I watched the preparations with such excitement I can recall each detail. You saddled your donkey and instructed two men to cut firewood. As we four trudged the trail together never had the sky been so blue or the landscape so beautiful. Two wonderful days of camping out, then you told the men to wait with the donkey while just we two climbed the hill to make a sacred sacrifice. Remember how you loaded the wood onto my shoulders. I felt so proud that you considered me big enough for the task but you kept glancing at back at me. It was a troubled look. I tried to reassure you that I could manage the climb. Then I saw tears in your eyes. I knew they were not tears of pride and joy. I couldn’t understand. Was I failing this test of manhood? Had I let you down? You didn’t look at me again until I called out to you. It hit me all of a sudden that we had a knife and things for the fire but there was no sacrificial lamb. I was reassured by your reply and the way you waited for me to walk beside you. But when the altar was built I saw a new wild look in your eye. You seemed obsessed by some mission and you spoke to someone who wasn’t there. I was frightened, very frightened. Your explanation made no sense. But I couldn’t run away. This was the only thing you had ever asked of me. I didn’t struggle as you bound me, I wanted to appear brave. God came first with you and that is how it had always been. Did you have any idea of my terror? You were my hero and you let me down in the most devastating way possible! But, your God did not let you down. When I saw your attention taken by something that turned out to be a ram snared in a thicket, your God became my God. It took me a long time to trust you after that. But I grew to see you were a man of faith and you had capacity for human love. You had other wives, not a custom I have followed, but I know you truly loved my mother. When she died it was not just a tear in your eye, you wept floods. Then you sought a field with cave suitable for a fine burial. Even though you could have had it for nothing, you weighed out the market price of 400 shekels. And it was there, dear Father, where Ishmael and I buried you. Yes Father, Ishmael and I eventually became close again. God had dealt kindly with him and his mother. Hagar was able to reach her Egyptian home in the court of the pharaoh and find a princess bride for your firstborn. Ishmael has become the father of 12 princes. I wanted to tell you this Father because I know deep down that you didn’t want to send Ishmael away. The way you did it was wrong but you were torn by the frailties of human love. I understand frailties. I fear my frailty will come between me and my beloved wife. No one is perfect but you taught me we can all trust in the perfect love of our God. This entry was posted in Uncategorized and tagged Aotearoa, Father's Day, New Zealand. Bookmark the permalink.